Liz has decided to major in Interior Design at University (at least, that's this week's plan! ), so when we were given the opportunity to review an item from Smitten NYC, we jumped at the chance! You see, Smitten NYC offers some very unique, stylish designs for young women on the go and that fits my Liz to a *T*. 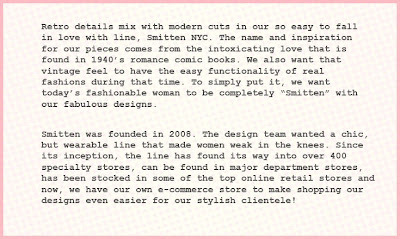 Smitten NYC offers Dresses, Cardigans, Sweaters, Tanks, and both casual and dressy tops. There is a really nice selection of designs -- especially suited to the young woman who has an eye for style and design. Liz decided on the Striped Tank Top with Beads in Grey and Black. As you can see from the photo -- it looks great on Liz. The fabric is light, cool, and so soft. It's just gorgeous! Liz loves it! Another piece that we love is the Reversible Short Sleeve Open Sweater in Navy. It's perfect for Liz as she stays cold (lucky kid!) and this would be perfect for her in classes this fall. Smitten NYC Blog on Tumblr, Facebook, and Twitter. The wonderful folks at Smitten NYC have generously offered one of our lucky followers the chance to choose an item ($100.00 or less) for their very own! Neat, huh? To enter this giveaway, just follow the instructions below! Good Luck! Our winners are chosen at random by True Random Number Generator. MANDATORY ENTRY: Please visit Smitten NYC and tell me which item you'd buy with your GC. Leave a link to that item, please! 1. "LIKE" (Fan) Smitten NYC on Facebook. Post on their wall and tell them Terri and Liz from Gathering My Roses sent you! 9 Post about this contest on your blog and link back here! 11. Grab our button and post it to your sidebar or favourites page! This contest will be open from Wednesday, July 14th until Wednesday, July 28th. Winner will be announced on Thursday, July 29th. 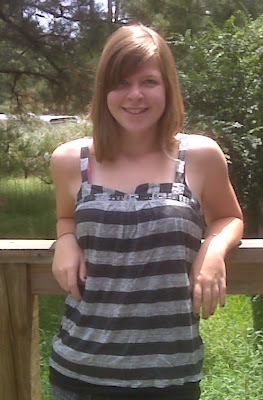 We were provided with a complementary Tank Top for the purpose of this review and giveaway. We were under no obligation to review this item. We received no other compensation. Our opinion is based solely on our own experience and use of the item reviewed. I love the Shredded Sleeve Sweater! Following Gathering My Roses via Facebook Networked Blogs!! I like the Floral Print Sleeveless Top. I am following smittern on twitter @creep4ward. This stuff is super cute. I love the racerback tank with sequins best. Cute stuff! I like the Double Layer Top with Studded Straps in Navy. Thanks for the review and giveaway! I am following Gathering My Roses via GFC. I "liked" Smitten NYC on Facebook under: Nicole O. & posted on their wall. I am now following Gathering My Roses via Facebook Networked Blogs under: Nicole O.
I am a fan of Gathering My Roses on Facebook under: Nicole O. Just like in your post, I absolutely love the Reversible Short Sleeve Open Sweater (http://www.smittennyc.com/product_detail.asp?page=1&NumRec=14&ItemNum=10&s_pid=8010&colorid=2909&s_cid=165&s_size=&s_price=&s_sale=) It's totally versatile. I'd get the Tank with Cartoon Detail. I like the Shirt with Neon Stones. sorry i didn't leave my email in my first comment about my top ! please let me enter please! fb fan courtney bella told them you sent me! I entered The Sak giveaway! I follow your blog with google friend connect - publicly! I like the Reversible Short Sleeve Open Sweater. Email available in my profile. I love the S/S Open Cardigan and would put my certificate toward it! My favorite is the Striped Tank Top with Beads in Grey and Black. "LIKE" (Fan) Smitten NYC on Facebook. Posted on their wall and told them Terri and Liz from Gathering My Roses sent me! I like the ribbon tank. I love the triped Ruffle Tank w/ Beads! I love the reversible open sweater in stone/taupe and the crystal tank top in blush. I "like" Smitten on Facebook (and posted). I am following GMR on Google Friend Connect! I am following GMR on Facebook Networked Blogs. I am a fan of GMR on Facebook! I entered the "New England coffee contest". I would love to get the 9:00 Floral Print Short Sleeve Shirt w/ Drawstring Waist! I follow @smittennyc on twitter as @ampaetka! I follow @mysticraindrops on twitter as @ampaetka! I follow @GeorgiaMist on twitter as @ampaetka! I love this shredded sweater!!! I'm following GMR via google! I like the Draping Dress. Navy/Stone Reversible short sleeve open sweater! I'm always cold, so this would be nice! I entered your New England Coffee giveaway. I would choose the exposed zipper tank in eggplant. I like Smitten NYC on Facebook. I follow @smittennyc on Twitter (@chompadomp). I follow Gathering My Roses via Google Friend Connect. I follow @mysticraindrops on Twitter (@chompadomp). I follow @GeorgiaMist on Twitter (@chompadomp). I like the animal tunic. LIKE" Smitten NYC on Facebook. Posted on their wall and told them Terri and Liz from Gathering My Roses sent me! I Follow @GeorgiaMist on Twitter. I Follow @mysticraindrops on Twitter. Entered the New England Coffee giveaway.